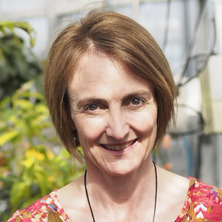 Dr Elizabeth (Liz) Dann joined QAAFI’s Centre for Plant Science in October 2010. She is a plant pathologist based at the Ecosciences Precinct at Dutton Park. Her research aims to increase the productivity and quality of tropical and sub-tropical crops through improved management of diseases. She obtained her PhD in 1995 from the University of Sydney, and undertook post doctoral research at Michigan State University, USA and at the University of Sydney, prior to joining the Plant Pathology (Horticulture) research team within the Queensland Government in 2002. Dr Dann has broad expertise in the discipline of plant pathology. Her diverse area of research includes investigation of natural defence mechanisms in plants, plant disease epidemiology and diagnostics. Her research is very focused on delivering improved quality and productivity to horticultural industries through optimised disease management. She is recognised internationally for her work on systemic induced resistance in plants and its practical implementation. A large component of her research is focused on assessing non-traditional products or treatments that may be valuable in disease management, such as compounds which activate disease resistance pathways. Such products are becoming more popular given concerns over pesticides in the environment and residues in fruit, and the drive towards more sustainable production of our food. Dr Dann supervises several students on projects investigating molecular diversity and epidemiology of fungal pathogens and constitutive and inducible plant defences. Current active areas of research include: assessment of avocado rootstocks for resistance to Phytophthora cinnamomi optimising phosphonate treatments for management of Phytophthora root rot epidemiology of brown root rot disease of avocados and related molecular diversity of causal “Phellinus noxius” fungi assessment of best management practices for reducing losses in mango and avocado caused by postharvest diseases investigations of UV-C exposure of fruit for disease control systemic induced resistance in passionfruit to Passionfruit Woodiness Virus evaluation of soil amendments for improved soil and plant health and soilborne disease suppression. Dann, Liz (2018) Ongoing rootstock trial Tristate region. Talking Avocados, 29 2: 58-59. Avocado is affected by fruit and orchard diseases caused by several different fungi. Stem end rot of fruit and branch canker and dieback are diseases associated with Botryosphaeria fungi (eg. Fusicoccum, Neofusicoccum and Lasiodiplodia), Phomopsis sp. Pestalotiopsis and others, yet we don't really know if fungi are specific to either fruit disease or branch dieback, or whether they are generalists and can infect all plant parts. Firstly, a survey of fruit and orchards from all growing regions across Australia will establish an isolate collection. These will be accurately identified, and molecular phylogeny studies undertaken. Pathogenicity tests will check for ability of different species or isolates within a species to cause disease in different plant tissues. The student will evaluate factors exacerbating severity and potential management strategies, eg. fungicidal graft and pruning wound dressings, or targeted orchard treatments. The potential of Scolytid beetles to vector the pathogenic fungi may be investigated, time permitting. The project may be expanded to include other crop species, such as blueberry. The PhD student will ideally have some plant pathology and/or soil science knowledge and a desire to undertake research for impact in agriculture. Phytophthora root rot, caused by the oomycete pathogen Phytophthora cinnamomi, is the most serious constraint to avocado orchard productivity. The disease is managed by an integrated approach including resistant rootstocks, clean planting material, good irrigation and drainage, and the strategic use of phosphonate pesticide. Phosphonate has been shown in other plant species to be fungistatic (inhibitory to oomycete pathogens) but also to activate plant defence responses. These defence responses have not been investigated in avocado, and is the focus for the proposed project. The student will ideally have some plant pathology and/or crop science/horticulture knowledge and a desire to undertake research for impact in agriculture. This project would suit a PhD student and is available now. The project is based at the Ecosciences Precinct, Dutton Park. Please email e.dann@uq.edu.au, or phone 3443 2455. Preliminary work in my lab has demonstrated that an exudate from Calonectria ilicicola, a fungus causing stunting and black root rot of avocado, causes abnormal growth and necrosis in tomato seedlings. Mycotoxins from this family, the Nectriaceae, are known, but have not been well studied. The student will firstly investigate whether isolates of this fungus, and related Dactylonectria spp. produce toxins in culture which are detrimental to the growth of avocado, or other model plant species. If yes, then the active components of the extract will be elucidated. Further experimentation would determine whether the toxin was vital for infection. Coates, Lindy, Akem, Chrys, Cooke, Tony, Dann, Elizabeth and Young, Anthony (2010). Mango. In Denis Persley, Susan House and Tony Cooke (Ed. ), Diseases of fruit crops in Australia (pp. 157-174) Collingwood, VIC, Australia: CSIRO Publishing. Pegg, Ken, Coates, Lindy and Dann, Elizabeth (2009). Avocado. In Tony Cooke, Denis Persley and Susan House (Ed. ), Diseases of Fruit Crops in Australia (pp. 49-64) Collingwood, Australia: CSIRO Publishing. Reglinski, Tony, Dann, Elizabeth and Deverall, Brian (2007). Integration of induced resistance in crop production. In Dale Walters, Adrian C. Newton and Gary Lyon (Ed. ), Induced Resistance for Plant Defence: a sustainable approach to crop protection (pp. 201-228) Oxford, UK: Blackwell Publishing. Parkinson, L. E., Shivas, R. G. and Dann, E. K. (2018) Dactylonectria lombard & crous. Australasian Plant Pathology Society Pathogen of the Month, . Black root rot of avocado – what do we know and how can we manage it? Parkinson, L., Dann, E. and Shivas, R. (2018) Black root rot of avocado – what do we know and how can we manage it?. Talking Avocados, 28 3: 35-39. Does silicon amendment benefit avocado tree health or fruit quality? Dann, E. K. (2018) Does silicon amendment benefit avocado tree health or fruit quality?. Talking Avocados, 28 4: 53-56. Dann, E. (2017) Summary of growth and yield data from the Waikerie rootstock trial, 2013-1016. Talking Avocados, 28 1: 30-34. Dann, E. K. and Parkinson, L. E. (2017) Three “other” diseases impacting avocado productivity in Australia. South African Avocado Growers' Association, 40 24-27. Dann, E. (2016) Lifting productivity through improved disease management. Talking Avocados, 26 4: 40-41. Dann, E. and Howe, W. (2016) Protective effect of silicon against root rot in avocado: a new research project. Talking Avocados, 27 3: 34-34. Dann, E. (2015) Investigating black root rot in avocado: A new research project. Talking Avocados, 26 3: 30-31. Armour, D. and Dann, E. (2014) Research Update Phellinus noxius (Brown root rot). Talking Avocados, 25 1: 38-39. Dann, E., Whiley, T., Pegg, K., Dean, J., Chandra, K. and Smith, L. (2013) Evaluation of fruit yields and tree health of Hass trees grafted to 8 rootstocks in high Phytophthora root rot conditions at Childers, QLD. Talking Avocados, 24 3: 34-37. Akem, C., MacManus, G., Dann, L., Coates, L., Cooke, T. and Lakhesar, D. (2013) The use of plant activators in mango postharvest diseases management. Acta Horticulturae, 992 369-375. Dann, E., Forsberg, L., Cooke, T. and Pegg, K. (2012) Calonectria ilicicola (Cylindrocladium parasiticum) a newly confirmed root pathogen of avocado. Talking Avocados, 22 4: 29-31. Dann, E., Smith, L. and Pegg, K. (2010) Phytophthora trunk canker. Talking Avocados, 20 4: 26-27. Hofman, P., Marques, R., Stubbings, B., Dann, E. and Coates, L. (2010) Using lower storage temperatures to improve Hass avocado fruit quality after storage. Talking Avocados, 21 3: 26-29. Dann, E., Smith, L. and Pegg, K. (2010) Verticillium wilt more severe in 2009. Talking Avocados, 20 32-33. Bally, I. S. E, Hofman, P., Irving, D., Coates, L. and Dann, E. K. (2009) The effects of nitrogen on postharvest disease in mango (Mangifera indica L ‘Keitt’). Acta Horticulturae, 820 365-370. Deverall, B. J. and Dann, E. K. (1995) Induced resistance in legumes. Induced resistance to disease in plants, 1-30. Parkinson, L., Shivas, R. and Dann, E. K. (2018). Phylogeny and molecular diagnosis of nectriaceous fungi associated with black root rot in avocado. In: International Congress of Plant Pathology (ICPP), Boston, MA United States, (58-58). July 29-August 03 2018. Salgadoe, Surantha, Robson, Andrew, Lamb, David and Dann, Elizabeth (2018). Remote Sensing techniques for managing Phytophthora root rot in avocado. In: 21st Precision Agriculture Symposium, Adelaide, SA, Australia, (12-16). 10-11 September 2018. Dann, E. K., Souza, P. S., Le, D. P., Parkinson, L. E. and Duff, J. D. (2017). Investigating biofumigation and composted chicken manure to manage soilborne pathogens of avocado. In: Science Protecting Plant Health, Brisbane, Queensland, Australia, (70-70). 26-28 September 2017. Parkinson, Louisa E., Roger, Roger G. and Dann, Elizabeth K. (2017). Investigating soilborne nectriaceous fungi impacting avocado tree establishment in Australia. In: Science Protecting Plant Health, Brisbane, QLD, Australia, (162-162). 26-28 September 2017. Parkinson, L. E., McTaggart, A. R., Shivas, R. G. and Dann, E. K. (2015). Investigating soilborne nectriaceous fungi associated with black root rot in avocado. In: Pests and Diseases. VIII World Avocado Congress 2015, Lima, Peru, (41-41). 13-18 September 2015. Parkinson, L. E., McTaggart, A. R., Shivas, R. G. and Dann, E. K. (2015). Investigating soilborne nectriaceous fungi associated with black root rot in avocado. In: Proceedings of the 20th Biennial Conference of the Australasian Plant Pathology Society. 20th Australasian Plant Pathology Conference, Fremantle, Western Australia, Australia, (51-51). 14-16 September 2015. Parkinson, L. E., McTaggart, A. R., Shivas, R. G. and Dann, E. K. (2014). Investigating soilborne nectriaceous fungi associated with black root rot in avocado. In: 8th Australasian Soilborne Diseases Symposium, Hobart, Tasmania, Australia, (9-9). 10-13 November 2014. Kasson, M. T., O'Donnell, K., Rooney, A. P., Sink, S., Ploetz, R. C., Ploetz, J. N., Konkol, J. L., Carrillo, D., Freeman, S., Mendel, Z., Smith, J. A., Black, A. W., Hulcr, J., Bateman, C., Stefkova, K., Campbell, P. R., Geering, A. D. W., Dann, E. K., Eskalen, A., Mohotti, K., Short, D. P. G., Aoki, T., Fenstermacher, K. A., Davis, D. D. and Geiser, D. M. (2013). An inordinate fondness for Fusarium: Phylogenetic diversity of fusaria cultivated by Euwallacea ambrosia beetles on avocado and other plant hosts. In: 2013 APS-MSA Joint Meeting Abstracts of Presentations. APS-MSA Joint Meeting, Austin, TX United States, (S2.71-S2.71). 10=14 August 2013. Coates, L. M., Dann, E. K., Shuey, L. S., Smith, L. A., Dean, J. R., Cooke, A. W., Pegg, K. G., Hofman, P. J., Marques, J. R., Stubbings, B. A. and Whiley, A. W. (2011). Effects of rootstock on avocado fruit quality – assessment of postharvest disease, major cations and biochemical traits. In: 7th World Avocado Congress 2011 - Conference Proceedings. 7th World Avocado Congress 2011, Cairns, QLD, Australia, (206-214). 5-9 September 2011. Smith, L. A., Dann, E. K., Leonardi, J., Dean, J. R. and Cooke, A. W. (2011). Exploring non-traditional products for management of postharvest anthracnose and stem end rot in avocado. In: 7th World Avocado Congress 2011 - Conference Proceedings. 7th World Avocado Congress 2011, Cairns, QLD, Australia, (215-221). 5-9 September 2011. Smith, L. A., Dann, E. K., Pegg, K. G. and Whiley, A. W. (2011). Field assessment of avocado rootstock selections for resistance to Phytophthora root rot. In: 7th World Avocado Congress 2011 - Conference Proceedings. 7th World Avocado Congress 2011, Cairns, QLD, Australia, (222-225). 5-9 September 2011. Hofman, P.J., Dann, E., Marques, R., Coates, L., Smith, L., Stubbings, B., Dean, J. and Cooke, A. (2011). Improving ‘Hass’ avocado quality after storage; the role of rootstocks, crop load and storage temperatures. In: Inaugural Joint Conference of Australasian Postharvest Horticulture Conference Organising Committee, the Australian Society for Horticultural Science and the New Zealand Institute of Agriculture and Horticulture Science on the theme “Horticulture for the Future”, Lorne, VIC, Australia, (). 18-22 September 2011. Dann, E.K., Smith, L.A., Shuey, L.S. and Begum, F. (2011). Phellinus noxius: A basidiomycete fungus impacting productivity of Australian avocados. In: 7th World Avocado Congress 2011 - Conference Proceedings. 7th World Avocado Congress, Cairns, QLD, Australia, (63-63). 5-9 September 2011. Ploetz, R. C., Dann, E., Pegg, K., Eskalen, A., Freeman, S. and Ochoa, S. (2011). Quarantine threats: What happens when new and old diseases move. In: 7th World Avocado Congress 2011 - Conference Proceedings. 7th World Avocado Congress, Cairns, QLD, Australia, (). 5-9 September 2011. Marques, J., Hofman, P., Whiley, A., Dann, E., Coates, L., Stubbings, B., Smith, L., Dean, J. and A. Cooke (2011). Rootstocks affect quality of ‘Hass’ avocado fruit after storage. In: 7th World Avocado Congress 2011 - Conference Proceedings. 7th World Avocado Congress, Cairns, QLD, Australia, (625-630). 5-9 September 2011. Hofman, P., Marques, J., Dann, E., Coates, L., Stubbings, B., Smith, L., Dean, J. and Cooke, A. (2011). Storage of ‘Hass’ avocado below 5°C. In: 7th World Avocado Congress 2011 - Conference Proceedings. 7th World Avocado Congress, Cairns, QLD, Australia, (658-658). 5-9 September 2011. Dann, Elizabeth K., Forsberg, Leif I., Cooke, Anthony W., Pegg, Ken G., Shivas, Roger G. and Tan, Yu Pei (2011). The ‘Cylindro’ complex of avocado root pathogens. In: 7th World Avocado Congress 2011 - Conference Proceedings. 7th World Avocado Congress, Cairns, QLD, Australia, (66-72). 5-9 September 2011. Zainuri, M., Dann, E., Coates, L. and Irving, D. (2010). Alkenylresorcinols in peel of 'Kensington Pride' mango have antifungal effects against Anthracnose disease. In: Annual Conference of the American Society for Horticultural Science, Palm Desert, CA, United States, (S151-S152). 2-5 August 2010. L. A. Smith, E. K. Dann, K. G. Pegg and A. W. Whiley (2010). Management of Phytophthora cinnamomi in Australian avocado orchards. In: 6th Australian Soilborne Diseases Symposium, Twin Waters, QLD, (). 9-11 August 2010. Dann, E. K., Smith, L. A. and Pegg, K. G. (2010). Soilborne diseases impacting avocado production in Australia. In: 6th Australian Soilborne Diseases Symposium, Twin Waters, QLD, (). 9-11 August 2010. Dann, E. K, Coates, L. M.,, Dean, J. R, Smith, L. A.,, Cooke, A. W and Pegg, K. G. (2009). Effect of avocado crop load on postharvest anthracnose and stem end rot, and cations and phenolic acid levels in peel. In: Plant Health Management: An integrated approach. 17th Biennial Australasian Plant Pathology Society Conference, Newcastle, Australia, (). 29 September – 1 October, 2009. Dann, E. K.,, Smith, L. A.,, Grose, M. L.,, Pegg, G.S. and Pegg, K. G. (2009). Phellinus noxius: brown root rot is increasing in importance in the Australian avocado industry. In: Plant Health Management: An integrated approach. 17th Biennial Australasian Plant Pathology Society Conference, Newcastle, Australia, (). 29 September – 1 October, 2009. Anderson, J. M., Coates, L. M., Dann, E. K. and Aitken, E. A. B. (2009). The diversity of Colletotrichum infecting lychee in Australia. In: APPS 2009 Plant Health Management: An Integrated Approach. 17th Australasian Plant Pathology Society Conference, Newcastle, N.S.W., Australia, (54-54). 29 September - 1 October 2009. Dann, E. K., and Zainrui (2008). Preharvest treatments for induction of resistance to postharvest diseases in fruits. In: 9th International Congress of Plant Pathology, Torino, Italy, (). 24-29 August 2008. Activating mango fruit defence to anthracnose disease. Zainuri,, Irving, D., Dann, E.K., Coates, L. and Wearing, A. H. (2003). Activating mango fruit defence to anthracnose disease.. In: Australasian Postharvest Horticulture Conference Proceedings. Australasian Postharvest Horticulture Conference, Brisbane, Australia, (149-150). 1-3 October, 2003. The effect of elicitors on mango fruit defence to anthracnose disease. Zainuri,, Irving, D., Dann, E, Coates, L. and Wearing, A. H. (2003). The effect of elicitors on mango fruit defence to anthracnose disease.. In: Food Safety, Quality Assurance and Environmental Sustainability, Emerging Challenges Confronting the Postharvest Sector.. Food Safety, Quality Assurance & Env. Sustainability, Nusa Dua, Bali, Indonesia, (104-104). 23-26 August, 2003. Muir, Sally, Khoo, Cheang, Offord, Cath, Summerell, Brett, McCabe, Bernadette, Brien, Julie, Dann, Elizabeth, Terras, Mary Ann and Tesoriero, Len (2001). Do plants need silicon?. In: , , (131-135). .